Use the Fast Track Ultra 8R to record drum kits and full bands on all eight inputs simultaneously, with superior 24-bit/96kHz high fidelity. 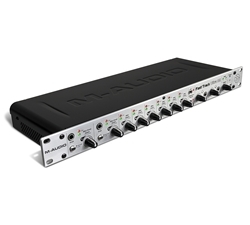 This interface delivers 8 inputs, 8 outputs, high-speed USB 2.0 connectivity, DSP mixing/effects, and eight preamps. The on-board MX Core DSP mixer processes eight hardware inputs and eight hardware outputs, supports monitoring with delay and reverb. Use this product with software such as WavePad Audio Editing Software and MixPad Multi-Track Software, and enable your studio recording through this single rack-mountable unit.